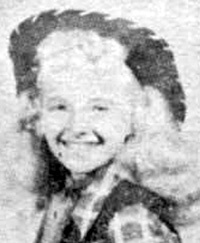 The Blue Bonnet Barn Dance went on the air as a television show over KCEN-TV out of Temple, Texas, a town east of Killeen and south of Waco on Interstate 35 now. And the station's manager at the time of this show is a familiar name in hillbilly music history. He was at WSM's Grand Ole Opry at one time. He also shows up on the KSTP Sunset Valley Barn Dance, too. Harry Stone was their manager. Along with him, program director Jim Bentley added to the show. The show was on Channel 6 and aired at 7:30pm on Saturday nights. 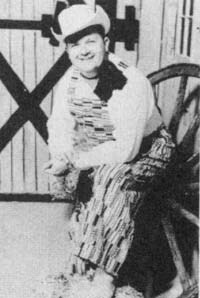 The show was lead by Clyde "Barefooted" Chesser along with his Texas Village Boys. They wrote in an article we found about the show that it went on the air in November of 1953. Keep in mind that the article we found was written in 1955, so that tells you it had some staying power. They said an estimated 140,000 folks would tune in this show every week. The station would get up to 1,000 cards and letters each week, a testimonial to its popularity. The show was so popular, that folks had to get tickets as early as four weeks in advance to be able to attend the show in person. Some of the other stars of the show that were mentioned were the Diamond Twins, Ramona and Wenona. At the time - they were only 18 years old.